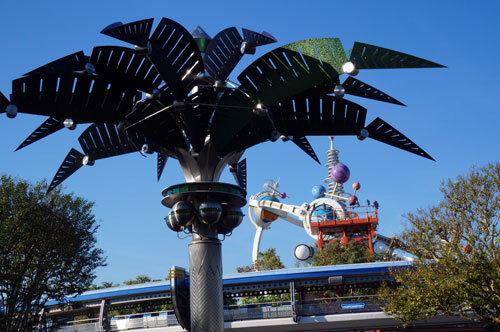 Metallic Palm Trees in Tomorrowland – Why Are They There? The Magic Kingdom is filled with all kinds of interesting trees and flowers. 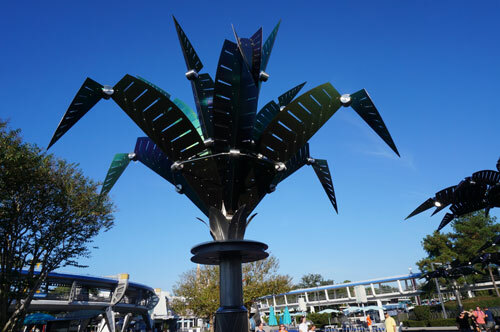 One of the most interesting set of trees in all of this park are made from metal and are located in Tomorrowland. 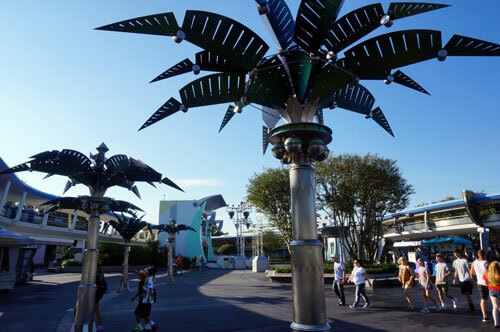 Have you ever noticed the row of metallic palm trees in Tomorrowland? They are located not far from Space Mountain. 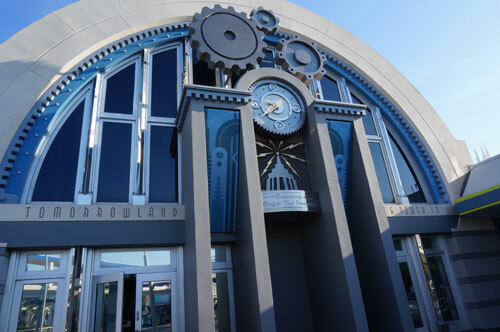 We all know the importance of energy to our future, and we see this topic pop up in many spots throughout Tomorrowland. One place the topic of energy comes up in Tomorrowland is the Monsters Inc. Laugh Floor. There, monsters have realized that laughter is more powerful than fright, and they invite the audience to help generate electricity needed to power Monstropolis. 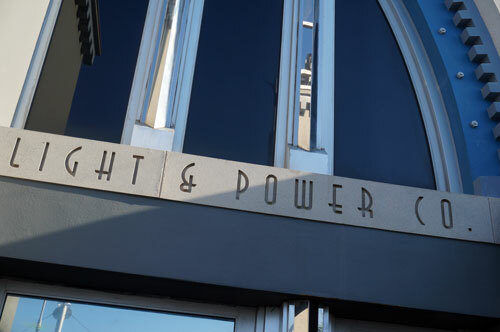 Another place where we see the topic of energy is at the Tomorrowland Light & Power Company. The Power Company has developed an ingenious product called Power Palms. 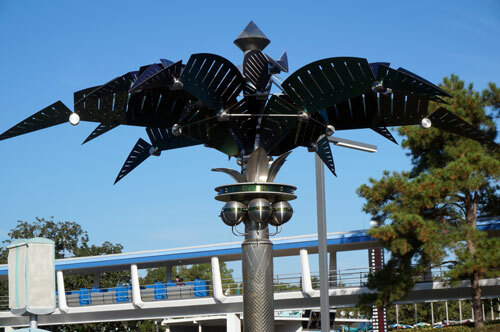 The backstory is that these metallic trees capture energy from the sun. They then store this energy in globes that hang from the trees, which look suspiciously like coconuts. 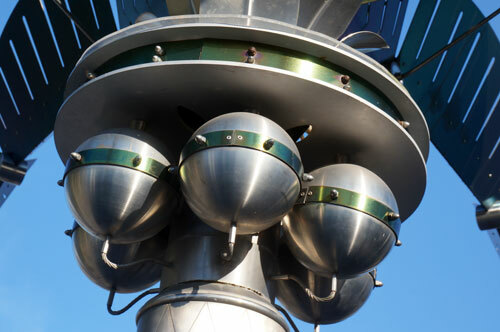 When the globes are full, the Power Company harvests them and uses the energy to power Tomorrowland. If you look carefully, you will notice that one Power Palm is folded up. You’ll also notice that that particular Palm has no coconuts. Why? Because the Power Company has already harvested the energy. The metallic trees are beautiful pieces of sculpture. 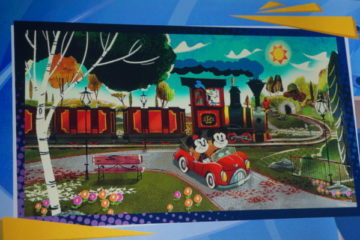 In the Disney backstory, they are used to collect power for Tomorrowland. 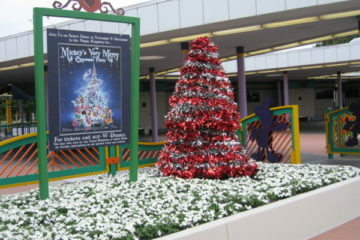 Disney placed the trees near Space Mountain and the Tomorrowland Power & Light Company. The “coconuts” store the power. 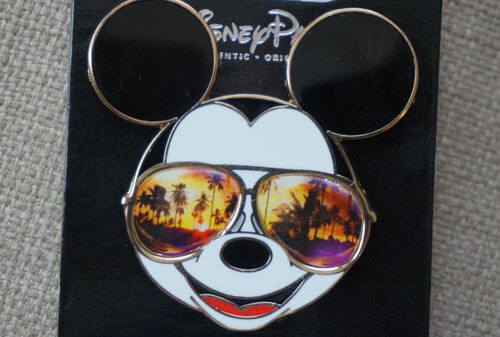 A long running Disney urban legend states that these Power Palms were originally designed to open and close. However, that is only a legend and the trees never did move. However, I have to say it would have been cool if they did! No “coconuts” here – the power has been harvested. 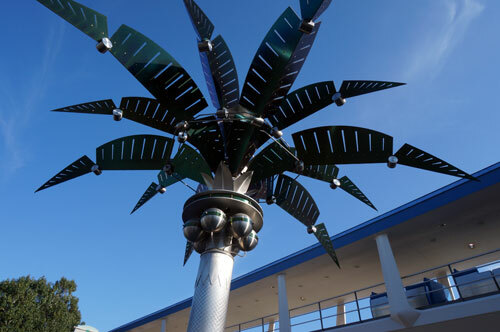 Disney didn’t have to create and install these beautiful metallic palm trees, which I think are actually works of art. Many people walk by them every day and never notice them, or never stop to wonder about the story behind them. The Power Palms are appropriately located near the Tomorrowland Power & Light Company. 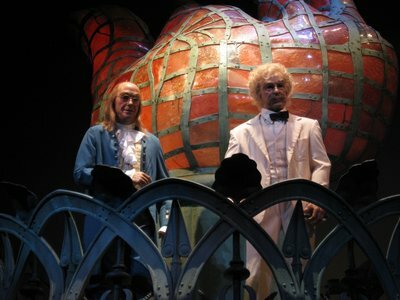 Now you know how Tomorrowland gets its power! 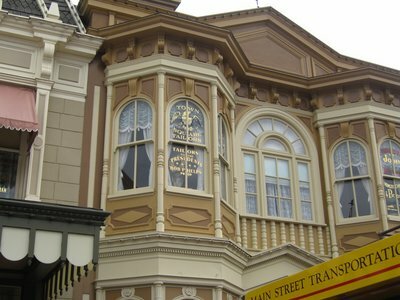 However, this is one of the little details makes Disney Parks special. 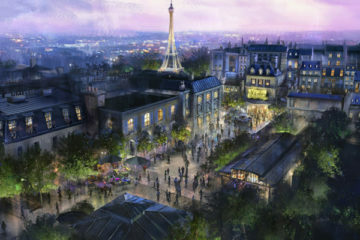 Disney Imagineers took the time to fully develop a story and then create a detailed environment that supports that story. The Power Palms are just one example of amazing details you can see all around the Magic Kingdom and all the other Parks of Walt Disney World. Have you noticed the “Power Palms” in Tomorrowland?